You’re almost there. Your resume landed you an interview and now it’s time to seal the deal. So what’s the best way to prepare? Below you’ll find the 10 best tips to help before, during, and after your interview. In today’s world, content is king. Goldman Sachs publishes quarterly reports, Microsoft records its earning calls, and every startup has a blog. Neither answer is wrong, but the latter says much more. It shows you’ve done your homework and give answers rooted in data. Keeping up with company news is hard, especially if you’re interviewing with multiple places at once. That’s why Google Alerts is a savior; it’s a tool that emails you anytime a new story appears for a specific term. That way, you learn about current events without searching for them. Soon enough, you’ll get updates on CAA and have more ammo for your interview. Nowadays, 91% of employers search your social media for any red flags. While most people tell you to watch every single thing you upload, there’s a much easier solution. Use Social Sweepster, an app that detects pictures of red solo cups, beer bottles, and other “suspicious” objects. It even detects profanity from your past posts! According to Glassdoor, the best time to interview is 10:30 AM on Tuesday. Remember, your interviewer has a world of responsibilities beyond hiring. They’re responding to emails, balancing projects, and meeting tons of other candidates so it’s crucial to consider when they’ll be in the best mental state to meet you. Avoid the bookends. On Mondays and Fridays, employees gear up for the week or wind down. By the same token, avoid the first or last slots of any workday. Avoid lunchtime. Immediately before noon, your interviewer may be too hungry to concentrate; immediately after, they may be in a food coma. Bottom line: if the firm is hiring for a job starting in a few months, try to interview late morning between Tuesday through Thursday. If the firm is hiring immediately, grab the earliest slot. This answer is like tearing out the first 200 pages of your autobiography. You leave out everything that gives meaning to why you want this job in the first place. What was your moment of epiphany? How did your childhood influence you? Why does this job move you? Most people don’t answer these questions. They start and end with their professional experience, leaving little to inspire the interviewer. Next time, use what I call a “Story Statement,” which is a Cliff Notes of your autobiography and shows that you’re a person, not just a professional. It also makes it easy for your interviewer to predict the next chapter of your story. Chances are, we’ve all had experiences we can connect to where we’re trying to go. It’s just a matter of selecting the right ones to tell our story. That said, if you struggle to craft your Story Statement for a particular interview, you might be applying for the wrong job. Most people overthink this question and give a canned answer like “I’m too much of a perfectionist!” Others give a genuine answer but still fall short of what this question is really asking. It’s not about admitting your weaknesses. It’s about showing how you overcome them. What systems have you put in place? What progress have you made? Include those thoughts to strengthen your answer. Problem – what was the situation? Action – what did you do to solve it? Result – what changed afterwards? 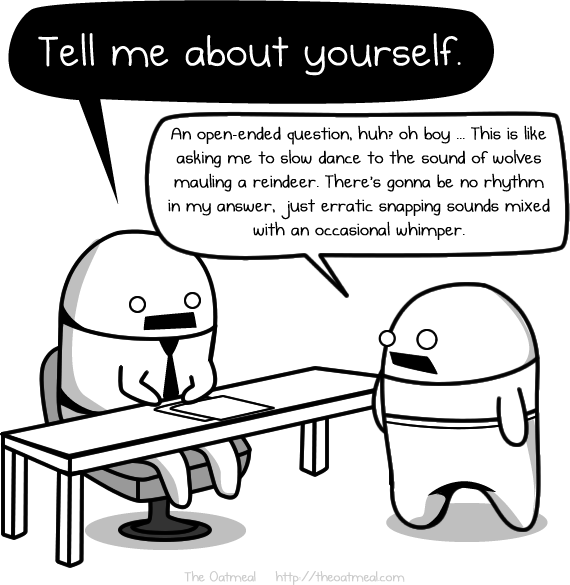 Some interviews include tough analytical questions. Whether you’re solving for an exact number (“what’s the EBITDA of Company X?”) or rough estimate (“how many ping pong balls can fit in a Boeing 777?”), it’s important to talk through your thinking. Don’t just give an answer; show how you got there. Strong: You’re talking the entire way through, sharing your calculations and assumptions. This is a great way to show your communication skills alongside your analytical ones. Plus, if you make an error, it’s easier to know where you went wrong and fix it. At the end of your interview, it’ll be your turn to ask a few questions. This is a perfect opportunity to kill two birds with one stone – that is, asking a genuine question while conveying something new about you. Most people just do the first part and forgo a final chance to impress the interviewer. Weak: Will this role provide opportunities to work in emerging markets? Strong: I’m passionate about languages and minored in Arabic in college. Will this role provide opportunities to work in emerging markets in the Middle East? Weak: What’s [Company X]’s fastest growing division? Strong: According to your quarterly report, your revenues grew by 17%. Is that because of a particular division within the company? This works beautifully if you haven’t found a natural way to bring up an accomplishment or cite a publication beforehand. Thank your interviewer within 24 hours of finishing. It not only shows your gratitude, it also combats recency bias if you interviewed early. Not to mention, it opens the door for dialogue even if you don’t get the job. Sometimes, recruiters reach back out on the same email thread months later, mentioning new job opportunities. Resume writing is constantly shifting and changing. Although resumes are only one part of the job search journey, they are still a vital requirement in every job seeker’s toolbox. Compile a resume incorrectly and you could find yourself being overlooked by employers and losing out on opportunities to advance your career. Yet it can be challenging to know what is trending as ‘current and savvy’ in resume writing versus ‘old-fashioned and obsolete’. In order to increase resume success you need to keep abreast of evolving advances. Here’s some quick advice for the upcoming year. Brevity and more concise content are growing in importance. Even more targeted positioning, messaging, and branding are required to market one’s self. 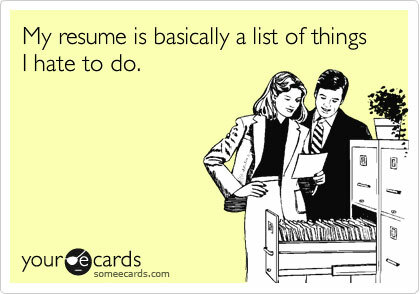 Resumes need easy-to-follow and easily digestible points. Short branding statements are replacing lengthier resume profiles. As ATS (Applicant Tracking Systems) continue to advance, so does the need for compatible resume formats. Job seekers must use the appropriate resume format when applying for online positions. Employers spend the majority of time reviewing the most recent role in a resume, so these roles must captivate and pack a lot of immediate punch. With the changing economy it is becoming more common to see short-term contract, multiple part-time roles, or diverse industry experience in a resume. The key is presenting varied work history in a relevant format that still aligns with targeted job requirements. Infographic and video resumes are gaining momentum. When used correctly, for the right industries, these visual resumes can help job seekers stand out. Integrating the right keywords in a resume increases the chances of the document being read – either electronically or by an actual person. Overuse or misuse of keywords is cautioned. Only add keywords to a resume in proper context, supporting them with examples of application and impact. If content is king in a resume; design is queen (for non-ATS applications). Spend equal amounts of time on content AND format. Employ savvy design components to attract attention, make certain elements stand out and, guide the reader through the document. Modern resumes commonly contain hints of color, unique section headers, different fonts, italics, decorative lines, charts, images, testimonials, or boxed text to capture and keep the reader’s eye. Finally, remember that resumes are career story-telling and not career obituaries. Avoid generic tasks or boring job overviews and focus on results, achievements, and accomplishments. Always demonstrate value. You are currently browsing the Norwood Consulting Group blog archives for January, 2015. Norwood Consulting Group © 2010 All Rights Reserved.